While many environmentalists quickly point out the adverse impact of the automobile — they quickly gloss over the environmental impact of near-empty light rail trains (and buses). The environmental impact of light rail, as a system, is considerably worse. The automobile takes passengers directly from origin to destination, but light rail requires supplemental trips to/from the station, whether via park-and-ride, kiss-and-ride, or bus. Due to the limited coverage of light rail stations, light rail requires altered bus routes to “feed the beast”. These feeders add cost, consume more energy, increase travel distance and increase travel times, while compounding the traffic congestion they are supposedly trying to alleviate. The light rail system is forced to provide an entire, high capacity vehicle even when there are only a few riders. The inconvenient truth is that not a single light rail in the US carries as many passengers as a single highway lane. 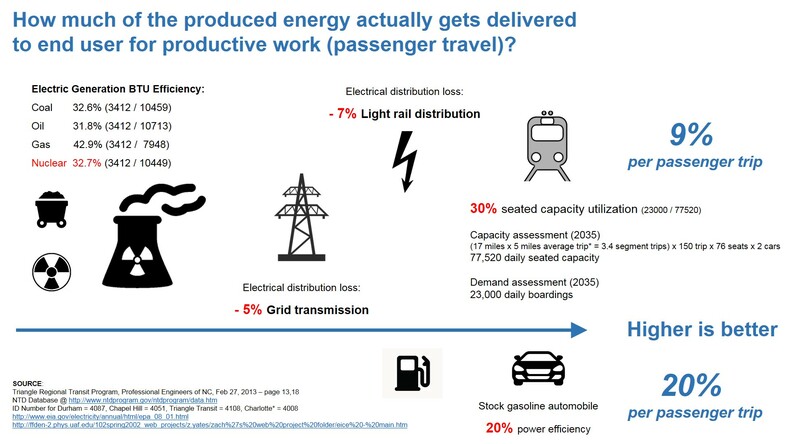 The myriad of alternatives, like walking, bicycling, carpooling, vanpooling, congestion pricing, telecommuting, flexible working hours, parking reform, pricing strategies to improve bus utilization, etc — largely ignored while the money and attention is consumed by light rail. The proposed Durham-Orange Light Rail train has NO new renewable energy requirement and is powered by electricity from Duke Energy. As a comparison, the Charlotte LYNX in 2010 required more than 4,000 British thermal units (BTUs) of energy per passenger mile, compared with about 3,500 for the average passenger automobile. 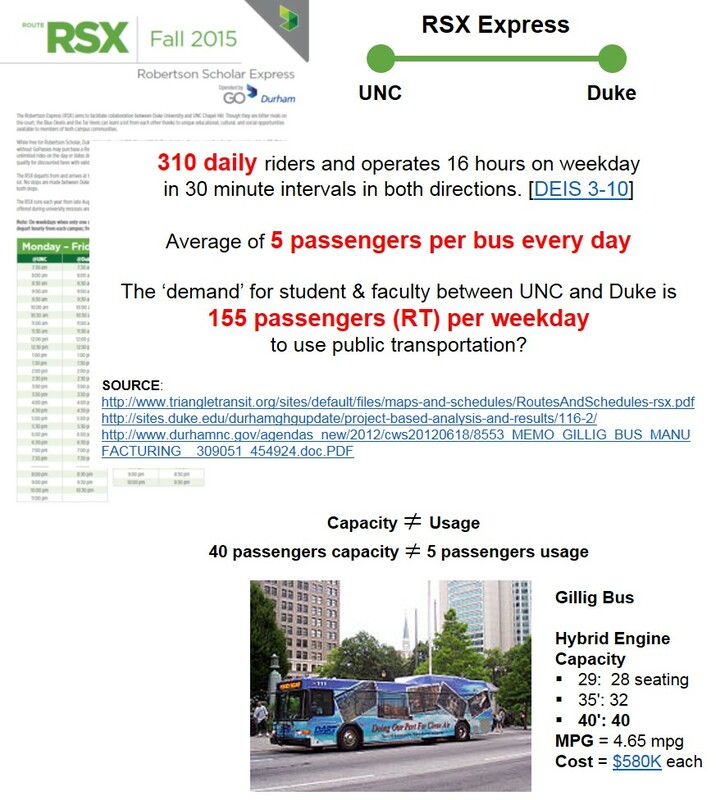 Carbon dioxide emissions from the electrical generation plants that supply power to North Carolina average slightly more a half a pound per passenger mile on Lynx, which is almost exactly the same as that emitted by gasoline-powered autos. When the high energy costs and carbon emissions during construction are counted, the light-rail line is far “browner” than autos and highways. Duke Energy generates electricity primarily with nuclear, gas and coal power plants. The Political Economy Research Institute ranks Duke Energy 13th among corporations emitting airborne pollutants in the United States. The ranking is based on the quantity (80 million pounds in 2005) and toxicity of the emissions. relative to those vehicles’ tailpipe emissions. SOURCE: How Green is Rail Travel? if its production involves the emission of CO2. of which 50% is from the chemical process, and 40% from burning fuel.